All of our designs can be created in 14k white or yellow gold. 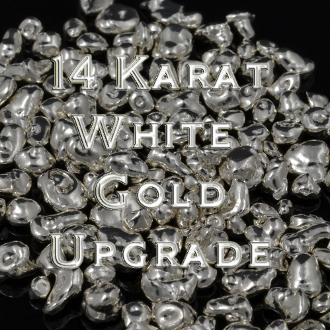 This upgrade is to cover the additional cost for choosing 14k white gold as an option. The cost to upgrade varies based on the item, ring size needed and the market price of the gold. Contact us for a price quote and we will instruct you which upgrade you need to select. Level #1 will be for a small woman's ring in a small size. The higher levels will be for heavy men's rings in larger sizes. We will need your ring size or sizes for an accurate quote for the gold cost. During periods of extreme gold market volatility, the price quote may only be good for the day the quote was given. The cost shown is in addition to the listed price of the ring in sterling silver. You will need to add the item you wish to purchase to the cart and then continue shopping and purchase the gold level upgrade we instructed you to purchase.